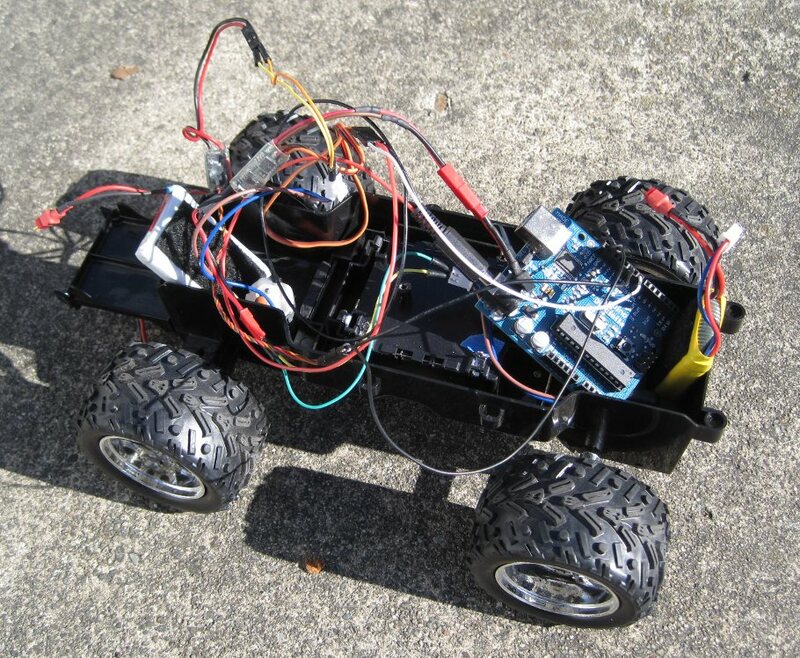 This is the story of my adventures learning to drive a little toy truck from an Arduino: specifically, how to drive the motors. Motor control turned out to be trickier than I expected, and I don't see a lot of "Arduino motor control for dummies" pages on the web, so I'm writing one. My truck is from a thrift shop. It has two brushed motors (about 280-350 size, in R/C plane parlance). It was originally radio controlled. It has space for 4 AA batteries, nominal 6v, which I thought should be perfect for the Arduino. First, you can drive a small motor directly by plugging one lead into ground and the other into an Arduino digital or analog output line. (Analog output isn't real analog output -- it uses PWM, pulse width modulation.) Don't do this. You risk damaging your Arduino, either by putting too much current through it (the Arduino maxes out at 40ma per pin, 200ma total; a small motor can pull several amps), or from back-EMF when the motor stops. Lots of Arduino-oriented shops sell "motor shields". I bought a Freeduino motor shield because I could get it from Amazon and it was cheap. It's a kit you have to solder together, but it's a very easy soldering job. The demo code is easy, too. I wired it up to the Arduino, loaded the demo code, hooked up my Arduino to the truck's onboard batteries, and ... nothing. Sometimes the motor would twitch a bit, or hum, but the truck didn't move. I wondered if maybe it was something about the batteries (though they were brand new). I tried plugging the Arduino in to the universal AC power supply I use for testing. No improvement. At first I suspected that the motor shield was junk because its 1 amp maximum wasn't enough. But I was wrong -- the problem was the batteries. Neither the truck's 4xAA batteries nor the (supposedly) 1 amp AC adaptor could put out enough current to drive motors. When it finally occurred to me to try a lithium-polymer model airplane battery (2 cells, 7.4 volts, 500 mAh), the truck immediately zipped across the floor and smashed into a chair leg. So motor shields work fine, and they're very easy to use -- but don't underestimate the importance of your power supply. You need a battery capable of supplying a fairly beefy current. But why is that, when the truck was designed for 4xAA batteries? Well, the 4xAAs can drive the motors, but they can't drive the motors, the Arduino and the shield all at the same time. If I power the Arduino separately off a 9v battery, the truck will move. It doesn't zip across the room like with the li-po battery, but at least it moves. So I had a solution. Except I wanted something a little cheaper. A $20-30 motor shield is fine for a one-time project, but I was also shopping for parts to teach a summer camp class in robotics. We're on a shoestring budget, and an additional $20 per team is a little too much. On a recommendation from Eugene at Linux Astronomy, who's been teaching wonderful robotics classes for several years, I discovered Pololu as a source of robotics equipment. Poking around their site, I found the TB6612FNG Dual Motor Driver Carrier, which is under $8 in quantity. Sounded like a much better deal, so I ordered one to try it out. The TB6612FNG comes with headers not yet soldered. I substituted female headers, so it would be easier to plug in jumper wires to the Arduino and the male leads from the motors. Writing an Arduino program for the TB6612FNG is a little more complicated than for the motor shield. It has two direction pins for each motor, plus a STDBY pin you have to keep high. So there are a lot more pins to manage, and when you change motor direction you have to toggle two pins, not just one. That'll make it more confusing for the students (who are beginning programmers), but I've written wrappers like drive(int whichmotor, int direc, int speed) to make it simpler. The motor driver has the same power supply issue as the motor shield did: I can't power it, the Arduino and the motors all from the 4xAA batteries. Like the shield, it works okay with the Arduino on 9v, and great with one li-po powering everything. It's been pointed out to me that an even cheaper way to run small motors, suitable for classrooms on a shoestring budged, is to use a transistor. Here's one circuit tutorial I found for that: Using a transistor to control high current loads with an Arduino. ESCs all have wierd proprietary arming sequences, so you have to figure out what they are (e.g. run the voltage up to maximum, hold there for two seconds, then down to zero, then hold for two seconds, then you're ready to drive) and write that into your code. If you switch ESCs, you may have to rewrite the arming code. ESCs only go in one direction -- fine for driving a truck forward, not so good if you need to drive a steering motor both ways. I'm sure ESCs have the same battery issue as the other two options, but I didn't even try running one off the AAs. Anyone who has ESCs sitting around probably has beefy batteries too. All the cool robotics hipsters (cHipsters?) buy H-bridge chips and build their own circuits around them, rather than using things like motor shields or motor drivers. This H-bridge circuit by Bob Blick is one popular example. (Those double-transistor-in-a-circle things are Darlington transistors.) But a web search like arduino h-bridge circuit turns up other options. For driving big motors, you definitely need your own H-bridge circuit (or an ESC), since all the available motor shields and drivers are limited to 2 amps or less. For small motors like my toy truck, I'm not sure what the advantage is. Except being one of the cool cats. For any sort of motor, either use a beefy battery (lithium polymer is idea, but you need a special charger and safety precautions for them), or use separate batteries for the Arduino and the motors. Motor shields are the easiest and most turnkey option. A motor driver is cheaper and smaller, but slightly more hassle to use. Use an ESC for big motors that only need to go in one direction, or if you're already a model airplane junkie and have some lying around. 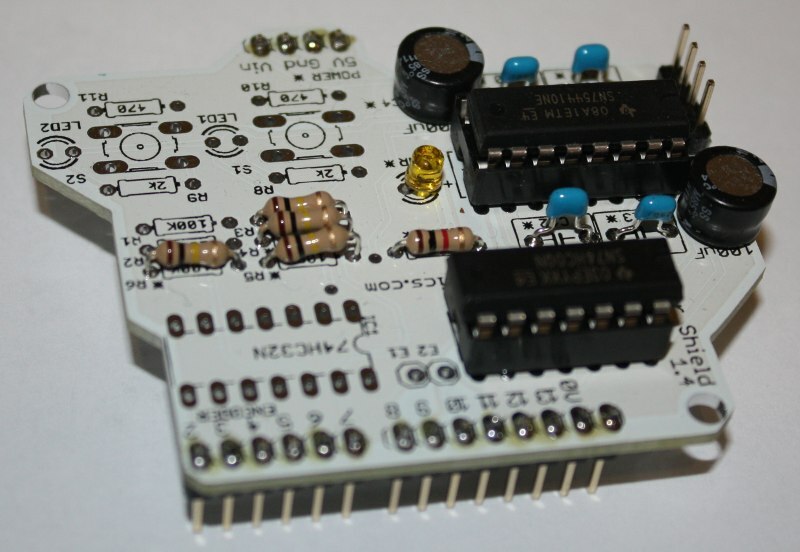 Use a custom H-bridge circuit if you're a cHipster or you have a really big motor project.